Welcome to East Islip Dental Care! Our highly skilled team has been serving patients in Long Island for over 18 years. If you’re looking for a high quality Islip dentist, you’ve come to the right place! We focus on offering excellent patient care, which includes a wide array of services and amenities to meet all of your dental needs. 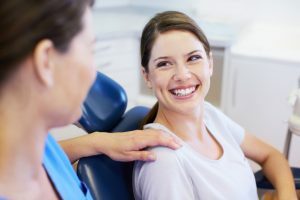 Here’s some more information about what you can expect at your first dental visit and some of the other services we offer at East Islip Dental Care. Most patient are surprised at the attention to detail they experience here at East Islip Dental Care. Our doctors spend a great deal of time with you at your first visit. This is so we can get to know you and discuss your goals and concerns for your smile with you. We spend time gathering information to give us a clear picture of your oral health, and we do this with a thorough examination and photos that we take of your teeth with our intraoral camera. We’ll discuss any issues or concerns that we detect, and by seeing your teeth up close in the photos, you’ll have a clear understanding of exactly what type of treatment you may need and why you need it. It’s our goal to be your partners in achieving and maintaining optimum oral health for a lifetime, and we’ll take the time to make sure you understand everything about your oral health and how it affects your overall health and well being. We welcome children to our practice and recommend that they begin visiting our office regularly at the age of three. Our friendly team understands how important these first dental visits are, and we make every effort to make your child’s visit to our office fun and upbeat. We’ll show them how to brush and floss properly at home, and teach them the value of good oral health. We also offer advanced services for children including fluoride treatments and dental sealants. Fluoride helps to “build” and strengthen your child’s teeth, while dental sealants are a thin coating that protects the chewing surfaces of your child’s teeth from tooth decay. If your child participates in sports, we can also make recommendations for mouth guards or other protective gear to keep your child’s teeth safe and healthy. At East Islip Dental Care, we strive to exceed your expectations at every visit to our office. We love building life-long relationships with our patients and providing high quality care designed to meet all of your dental needs. This is how we’ve built our reputation over the years. Contact us today to schedule your next dental appointment.